The SIGN SHACK sells decorative metal signs, magnets and cardboard celebrity cutouts. We offer a variety of sizes and shapes at reasonable prices. We always have at least 16,000 signs in stock at our warehouse on Mason Road. 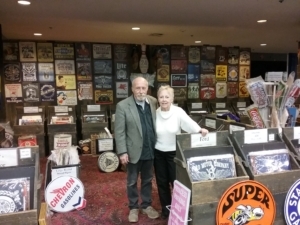 The SIGN SHACK is always a great attraction at FAIRPORT CANAL DAYS, as well as at CAVALCADE of CARS (HAMBURG, NY), NAPLES GRAPEFEST, SYRACUSE NATIONALS CAR SHOW, CANANDAIGUA and ALEXANDER STEAM SHOWS, DANSVILLE BALLOONFEST and ELLICOTT FALL FESTIVAL. Our great show display resembles a shack and has won an award for design, color, and creativity.